New Delhi, Aug 29 (IANS) Excessive self-criticism is sending wrong signals to foreign investors and the current economic scenario in India is not comparable with the 1991 crisis when the country was forced to pledge its gold to pay import bills, an Indian-American money manager has said. “I don’t think India is going through the 1991 like crisis. That situation was different. It’s not comparable,” said Natwar Gandhi, 72, chief financial officer of Washington DC, who is credited with the fiscal turnaround of the US capital from near bankruptcy in 2000 to a surplus budget today. “Foreign investors are withdrawing money not because something has suddenly gone wrong with the Indian economy. This is more to do with the US central bank’s move,” the Gujarat-born Gandhi, on a visit here for sharing his experience on urban governance, told IANS in an exclusive interview. An alumnus of the Louisiana State University, Gandhi was alluding to the US Federal Reserve’s hints at easing the fiscal stimulus that has been in force since 2008 to ward off the economic crisis, which experts say have hit currency markets in a host of countries, including India. Foreign funds have pulled out over $12 billion from Indian debt and equities markets since the US Federal Reserve hinted at tapering stimulus in late May. This has led to almost 20 percent slump in the value of Indian currency against US dollar and a sharp drop in stock markets. Gandhi said the huge pulling out of money by foreign funds from the Indian markets was linked largely to the US Federal Reserve’s comments. He said excessive self-criticism and political compulsions were adding to the volatility in the currency markets. “There are problems, but I see a great deal of self-criticism. Excessive self-criticism sends wrong signal to the foreign investors,” he said. Gandhi said India is passing through very difficult economic situation, even though the condition is not as critical as it was in 1990s. In 1991, India was forced to pledge its gold in order to pay its bills as the country’s foreign exchange reserve had fallen to $3 billion, not enough even to cover three weeks of imports. Today, the foreign exchange reserve is nearly $280 billion that can cover seven months of imports. Besides, the central bank has more tools to manage volatility in the currency markets. Gandhi pointed out the 1991 crisis had acted as a trigger for economic liberalisation, and the Indian government must take similar bold reform measures to emerge stronger out of the crisis. “You have to liberalise more. This is the only long lasting solution to these kind of economic problems,” he said. 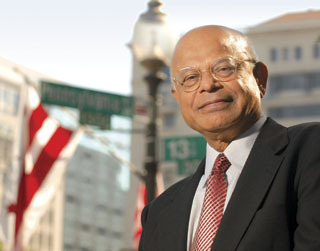 As chief financial officer of the District of Columbia, in which Washington falls, Gandhi is responsible for the city’s finances, including its nearly $7 billion in annual operating and capital funds. He has built on the city’s financial progress by securing multiple rating upgrades from the major rating agencies for its general obligation bonds. He said implementation is a major problem in India and it is a big drag on the country’s economic performance. “I understand that the government has political compulsions. But they must act. They must have a bold vision,” Gandhi told IANS. On opening up of India’s retail sector for foreign investment, Gandhi said resistance to the move was natural given its impact on a large number of small traders. “In Washington, there has been substantial resistance against Walmart. It is facing similar resistance in other cities of the United States. No wonder, similar resistance is going on in India as well,” he said. However, he emphasised that opening up of retail sector was good for consumers in India and the economy and the government must implement the decision and encourage foreign supermarket operators to set up shops.